The show function displays items from a roster in the form of a menu that looks like a roster. The group_name specifies which group contains the items to be displayed, one or more of which are specified in the item_list. 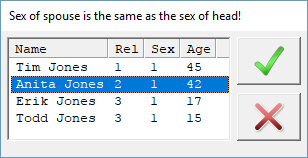 This function is similar to the show and accept functions, and is useful as a menu or simply as a way to show roster values in another part of the questionnaire. An optional string expression, heading, defines the title of the grid. An optional where clause, with a specified condition, allows you to only specify that only some occurrences of the roster should be displayed. If you want to override the column headings, you can specify them with string expressions in text_title. The function returns the number of the item selected: 1 for the first item, 2 for the second item, etc. This is the number of the item on the display, not in the roster. The value 0 is returned if the escape key (or back button) is pressed and none of the options is chosen.